Jorson & Carlson inventories all popular paper drills, manufactured to OEM specifications including paper drills for Baum, Challenge, Hang, Imperial, Iram, Lassco, Lawson, Lihit, Martin Yale, Nygren Dahly, Seybold, Spinnet, Sterling and others. 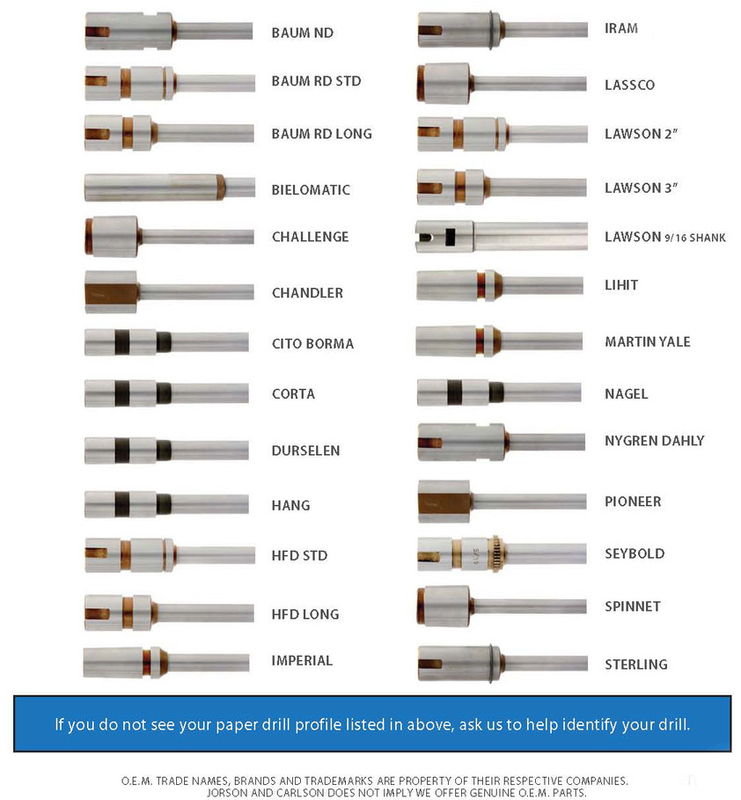 Shown below are the most common OEM paper drills showing the shank profiles of each. If you do not see your paper drill profile listed, let us know and we will help identify the paper drill. Our paper drills can be coated with wear resistant coatings such as Teflon and Titanium. Delivery on popular paper drills are in stock and non stock paper drills can be delivered in just a few short days. Jorson & Carlson also sharpens all paper drill and paper drill reamers for your hand sharpener or bench-top sharpener. Let Jorson & Carlson be your source for new paper drills. Did you know that Jorson & Carlson also sharpens paper drills? Call for pricing.